Globe is launching a new service for their subscribers! Please drop me an e-mail to [email protected] if you have successfully downloaded the application.Â Send in your Full Name, Globe Mobile number and email address. Why you NEED to e-mail me? I need to keep track of those who activated and downloaded UnliMAIL through me by reading this post.Â After Globe validates the list I send them, the 3-month FREE Unlimail subscription will be awarded to me and to ALL OF MY REFERRALS. UnliMAIL is an unlimited mobile email service that enables you to send and receive emails directly on your mobile device anytime, anywhere. *UnliMAIL is currently on BETA version until March 31, 2010. 2. What is UnliMAIL Beta? Beta is the initial version of UnliMAIL. During this period, we invite you to download and try UnliMAIL for yourself. Any inputs and comments on the service may be relayed to the team for consideration of inclusion in the final UnliMAIL version. 3. What can UNLIMAIL do for me? With UNLIMAIL, you are able to enjoy unlimited email communication and the freedom of mobility. Send and receive emails anytime, anywhere. Your emails are delivered to you real time, as if you were really online. No need for internet. Whether youâ€™re at the beach or mall, you are online 24/7. 4. Is my handset compatible with UNLIMAIL? Please go to www.globe.com.ph/unlimail and check our device list. If your device is not on the list, please contact our support team to find out if we are developing a client that will support your device. 5. How do I register to UNLIMAIL? Â· You will receive a SMS notification message containing a WAP link. Â· To download the UNLIMAIL application for FREE, click on the WAP link. Â· When asked for connection settings, choose myGlobe Connect APN. Â· The application will automatically download onto your phone. Â· Upon successful download, load the UNLIMAIL application on your phone to start sending and receiving emails. Once the pilot promo ends on March 31, 2010, you will have to send a SMS to activate your subscription after downloading the UNLIMAIL application. 6. How much does it cost to register to UNLIMAIL? As a pilot promo, UNLIMAIL will be on FREE trial until March 31, 2010. Final tariff rates will be released prior to the promo expiry date. 7. Until when is the FREE promo trial of UNLIMAIL? Free trial is until March 31, 2010. 8. Who can register to UNLIMAIL? 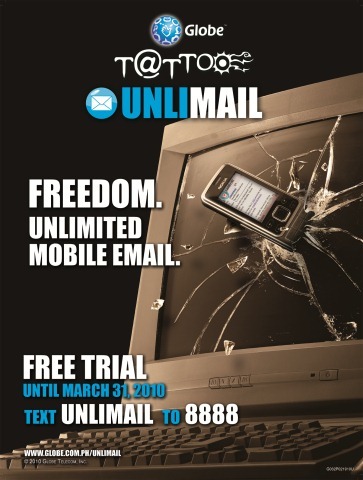 UNLIMAIL is available to all Globe Postpaid, Globe Prepaid, Globe Tattoo Mobile subscribers. 9. What email accounts can I push to my UNLIMAIL account? Important to note that for Java devices, the above email and data sources are supported, but only the Inbox can be pushed to the device. 10. What is Outlook Web Access? OWA is the Microsoft Exchange Outlook web access Interface that enables you to access your Exchange server mailbox over the Internet. 11. What if my mail source is not on the list? Please check back with us often, as we are adding new mail sources all the time. You may also place this request for our evaluation. 12. How many email accounts can I push to my UNLIMAIL account? For Symbian users, you can sync as much email accounts as you wish. For JAVA users, you can sync as much as 5 email accounts. 13. Can I upload and download attachments using UNLIMAIL? Yes you can upload and download attachments up to 500KB in size. Some ISP’s limit sending email through their outgoing (SMTP) mail servers ONLY to computers that are connected to their own network. In this case, the UNLIMAIL Gateway is not permitted to send email though this ISP’s SMTP mail server and you will only be able to receive email on your device. 15. Is my email safe using UNLIMAIL? 16. Does UNLIMAIL keep any of my data on its servers? 17. Does UNLIMAIL work in my office with the proxy server? 18. Do UNLIMAIL people know my email password? No, your Email password is stored encrypted on the device and is sent encrypted to the process running on the gateway. When the device disconnects, the password is removed from the gateway memory. 19. What do I do if I lose my device? If you misplace or lose your device, you need to change your mail account password so that if anyone finds your device cannot use UNLIMAIL to access your email account. 20. Where can I get help with my UNLIMAIL? For help in configuring and using Globe Tattoo UNLIMAIL, you may call Globeâ€™s 24 hr customer service hotline at 730-1000 or toll-free at 222. You can also visit the website for the UNLIMAIL user guide at http://www.globe.com.ph/unlimail. 20. How do I check my registration status? Just text UNLIMAIL STATUS to 8888. 21. If I open a HTML link on my UnliMAIL device, will browsing be free also? No. By clicking on the HTML link, you are directed to your phoneâ€™s web browser. Once this happens, you are charged the standard Globe Mobile Internet rate of Php 5 for 15 minutes. 22. Why canâ€™t I view, download, send attachments? The attachment functionality will be part of the UnliMAIL upgrade on February 26, 2009. Do note that JAVA clients can only receive and forward attachments. Also allows users to open 100kb max attachments. hi, how about postpaid users? soon Globe will expand it to more handsets…it’ll be available before u know it 🙂 they said so.